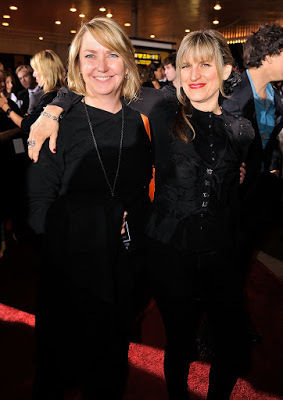 Nancy here with Catherine Hardwicke at the 'Twilight' Premiere back in 2008. • Los Angeles Times: And Stewart, who as a child costarred with Jodie Foster in "Panic Room," has proved herself post-"Twilight" not only with the big-budget follow "Snow White and the Huntsman" (one of 2012's top 20 films at the box office), but also with smartly chosen roles in indie movies like "Still Alice" and "Clouds of Sils Maria," which is generating Oscar buzz for the actress. "Kristen was a really gifted actress before she ever read 'Twilight,'" said Nancy Kirkpatrick, who worked with the actress when she served as the head of marketing at Summit Entertainment, which made the "Twilight" films. "When she's 50, we're still gonna see her work." "Now I watch her in interviews and feel like I'm actually seeing the real Kristen, but that's taken a long time," Kirkpatrick said of the 25-year-old. "She has an amazing team and publicist. She's practiced. But she also just grew up."